South Bend, Indiana September 25, 2018 - RACO introduces the 297 Old Work Pan. This shallow round electrical box mounts light fixtures to existing ceilings or walls. RACO, part of Hubbell Commercial Construction, provides innovative electrical products to commercial and residential markets. The new RACO 297 electrical box is designed to support light fixtures on the ceiling or wall in existing applications. Four inches in diameter and only half inch deep, the shallow pan doesn't interfere with plumbing or other obstructions already inside the wall. 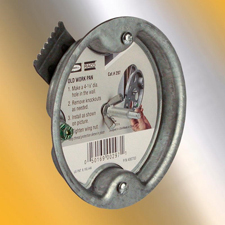 The patented design flange and screw-tightened bracket combination allow the 297 to be used on half inch or 5/8 inch drywall without mounting to a stud. Includes two 1/2 inch knockouts for connecting conduit and an 8 inch grounding pigtail. Zinc plated steel construction provides a 2-hour fire rating. RACO's new products provides electrical contractors an effective way to reduce installation time and increase productivity. The 297 will support light fixtures up to 6lbs. Easy to follow instructions and mounting hardware are included. Availability of the RACO 297Old Work Pan begins during 4Q2018. Find more information at www.hubbell.com.